4. Apple CarPlay: worth it? 9. Which options should I buy? Alas, the time has come to say goodbye to my red rocket long-termer, the SEAT Ibiza FR. I’ve covered just over 9,000 miles in KR17 NLU, and, truth be told, it’s done absolutely everything I could have asked of it. 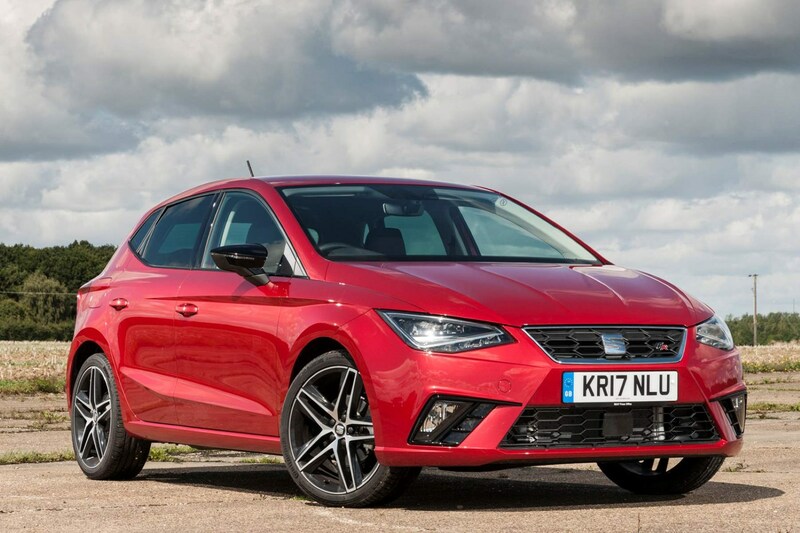 It’s not perfect, as my colleagues have not hesitated to point out, but the overall package has undoubtedly made it the best SEAT Ibiza yet, and one of the frontrunners in the supermini class. However, in the interests of fairness and impartiality, I’ll go through the niggles first. 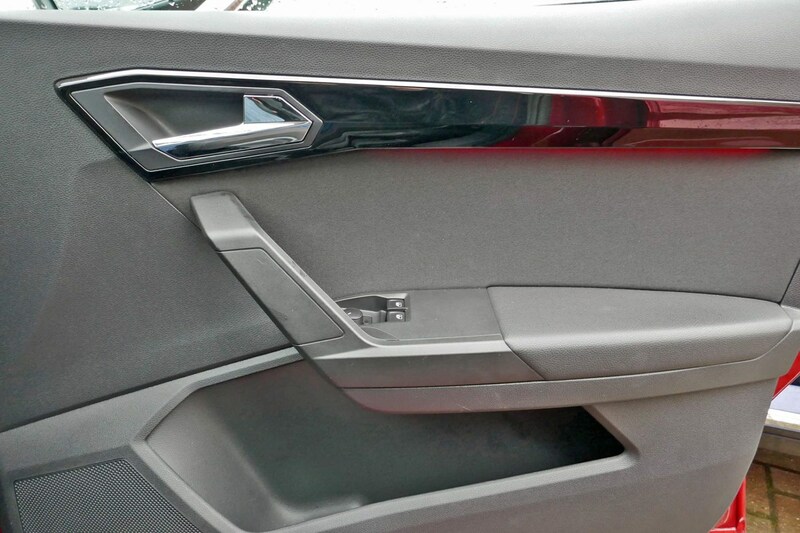 No parking sensors as standard – a personal niggle, this one, but surely parking sensors should be standard on a high-spec supermini such as the Ibiza? A short list, and it’s certainly questionable whether the last problem can be blamed on the car. Is the 115hp 1.0-litre petrol the engine to go for? Yes. Without a shadow of doubt. Having driven the less powerful versions and the top-of-the-range 150hp 1.5-litre EVO motor (my colleague Christofer Lloyd has driven the diesel and reckons it’s one to avoid), the mid-range 115hp 1.0-litre offers the best of both worlds. I managed a calculated average of 43.5mpg during my time with the car, 72% of the claimed figure. 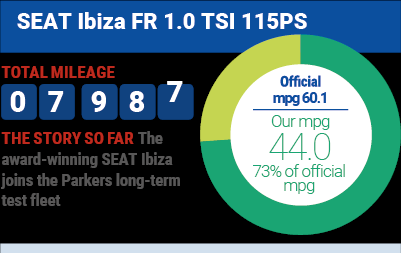 And that’s really not bad going considering much of the Ibiza’s driving was either undertaken in a spirited manner on motorways or B-roads. The reason for such an exuberant driving style? The Ibiza is excellent fun to drive. Not as sharp or adjustable as the Ford Fiesta, no, but that’s the payoff for its more grown-up feeling when driven normally. What the Ibiza does specialise in is allowing the driver to have clean, safe, sensible fun without smashing speed limits or upsetting fellow motorists. Many a time I would be heading home on an A-road just before the M25 and, amongst the terminally bored commuters, I would be bouncing along in the Ibiza, stretching the engine out and having a whale of a time. And not once did I feel like I was being the human reincarnation of Mr. Toad. Again, I reckon it’s the best spec available on the Ibiza. It brings out the car’s sharp, angular styling with sportier bodywork and more eye-catching wheels, although, for me, the optional 18-inch machined alloys look far better than the standard 17s. 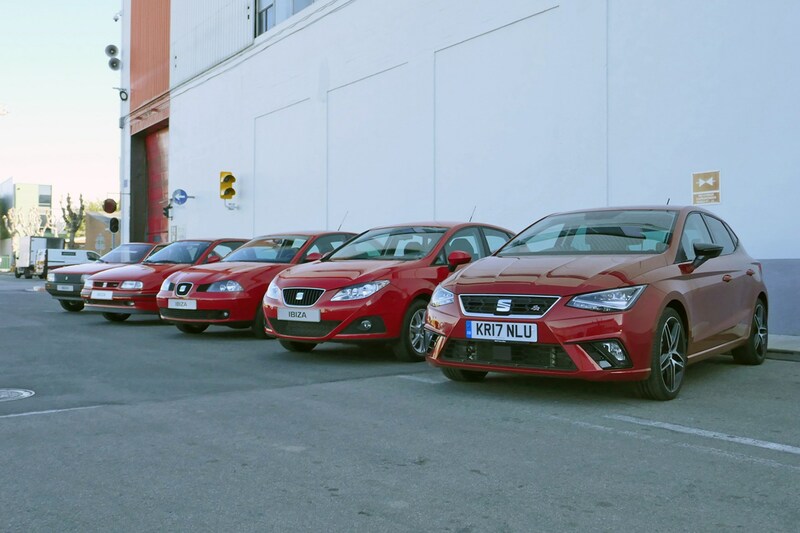 Taking the Ibiza to Barcelona and back shows just how far small cars have come. Sure, I expected to make it (we are in 2018 after all) but I didn’t think I’d make it in comfort – which is exactly what I did behind the wheel of the Ibiza. It was quiet, smooth and easy to drive – perfect for when you’re driving 2,000 miles on unfamiliar roads. Even my passenger, confined to the left-hand seat and unable to break up the monotony with a stint behind the wheel, wasn’t banging her head against the dashboard by the time we got back – something I doubt was down to my riveting (ahem) conversation. We suspected it on the launch back in summer 2017, and six months with the Ibiza has confirmed it. SEAT has well and truly closed the gap to the Fiesta. It is as good as the Ford, and – if there was any justice in the world – deserves the success of its arch rival. 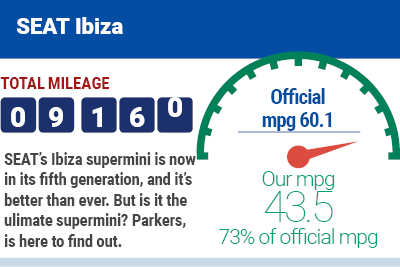 Also bear in mind the far more appealing PCP finance options on the Ibiza and for many, it will make considerably more sense - hence why it won our best small car category in the 2018 Parkers Awards. In all likelihood it won’t shift as many units of the Fiesta despite its competence. However, if you’re considering a new supermini and, by default, think that the VW Polo and Ford Fiesta are the only two worth considering – think again. KR17 NLU, thanks for the memories – you will be missed. The day of reckoning has arrived. My Ibiza has faced trial by car finance, trial by Volkswagen Polo and trial by round-trip to Barcelona – all of which it has taken in its stride. And yet, the final hurdle is without doubt the most challenging. Namely, is the SEAT Ibiza a match for Britain’s favourite supermini, the Ford Fiesta? 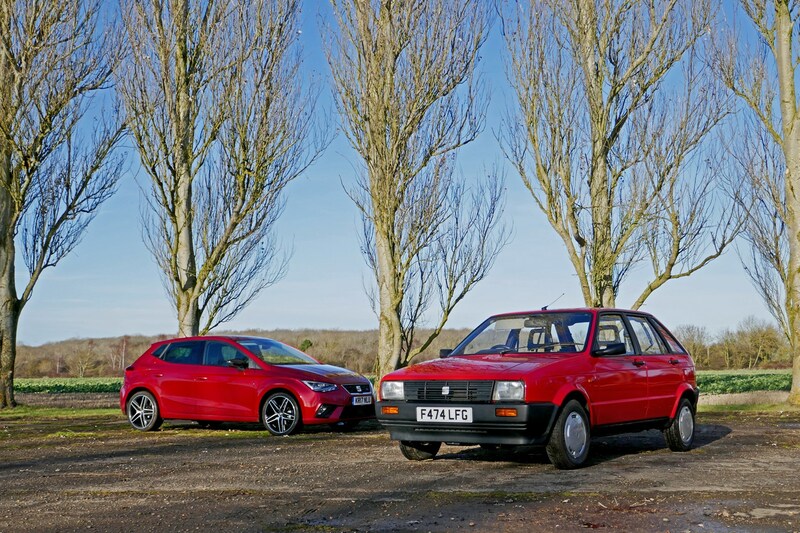 Working on the basis that a picture tells a thousand words, I enlisted the help of Parkers Senior Reviewer Tom Goodlad to film a twin test between the Ibiza and Fiesta. Alas, it wasn’t my Ibiza featured in the film, but considering both of us had driven just about every other variant of each model, it seemed sensible to try something a little different. So, if you got to the end of the video (and why wouldn’t you?) you’ll surely have appreciated what was a very fair, and balanced verdict. However, away from the cameras, which one of the two cars would I actually buy with my own money? Well, it’s mighty close, and I really do favour the way the Fiesta handles, but at the end of the day I prefer the overall image of the Ibiza and that’s enough to swing the verdict in its favour. Not a hugely scientific conclusion, granted, but an honest one nonetheless. Which one’s your favourite? Let us know in the comments section of the video and don’t forget to subscribe to the Parkers YouTube channel. Regular readers of this page will likely have a good understanding of my thoughts on the SEAT Ibiza by now. But what of the other members of the Parkers team? Do they agree with my musings, or have I been misleading all this time? The Ibiza and I had a somewhat rocky relationship. While I fully understand that it represents a brilliant financial proposition for younger buyers thanks to strong finance deals and free insurance, it simply didn’t appeal to me in the same way as the Ford Fiesta. 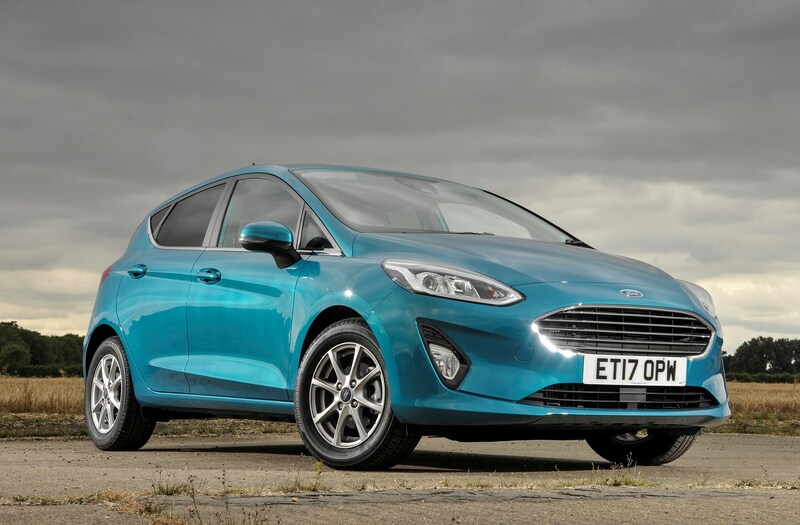 The driving position is the main issue – it may be a cliché but you feel sat on top of the Ibiza, whereas the Fiesta makes the driver more of a part of the experience. 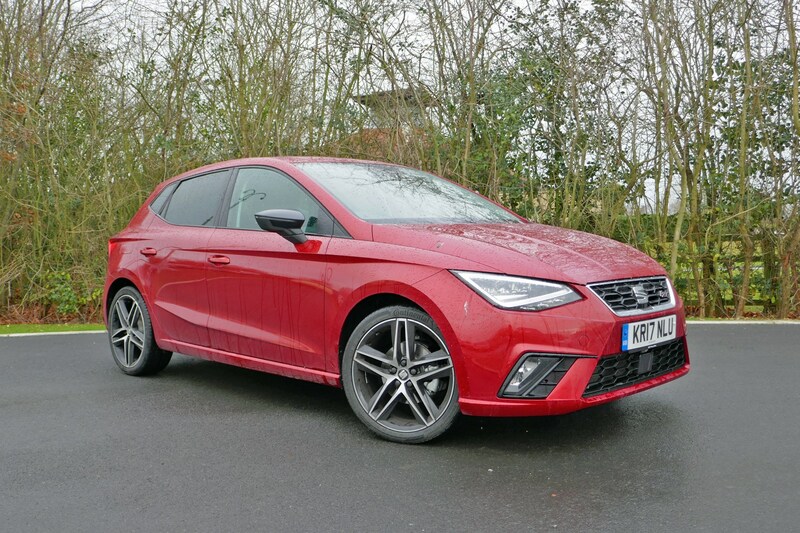 The SEAT’s engine isn’t as smooth as Ford’s either, which really matters at the higher end of the trim structure such as on our FR-spec long-termer. That isn’t to say the Ibiza is a bad car, though. It’s simply not as memorable. Maybe that’s why the Fiesta remains the UK’s bestselling car. 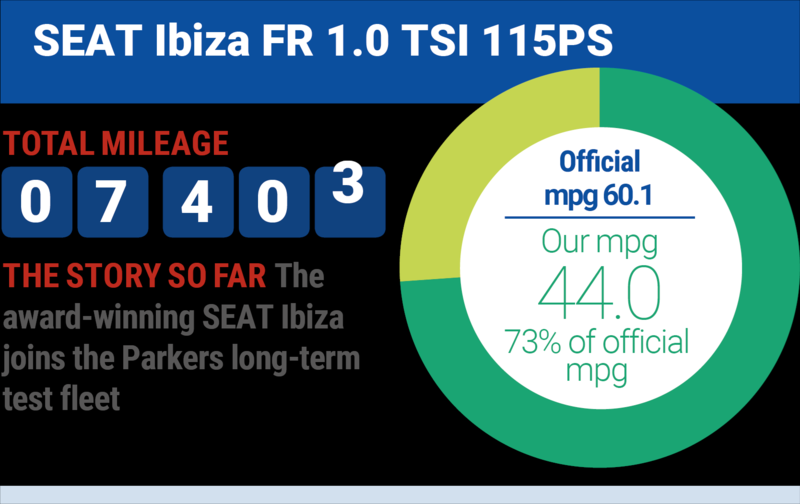 An enormous plus point from a personal perspective is how sharply suited the latest-generation Ibiza is. It looks so well-proportioned and nicely detailed, that the related Polo looks a bit pudgy. Ideally, it’d look like more of a styling step over its predecessor, but I can live with that. 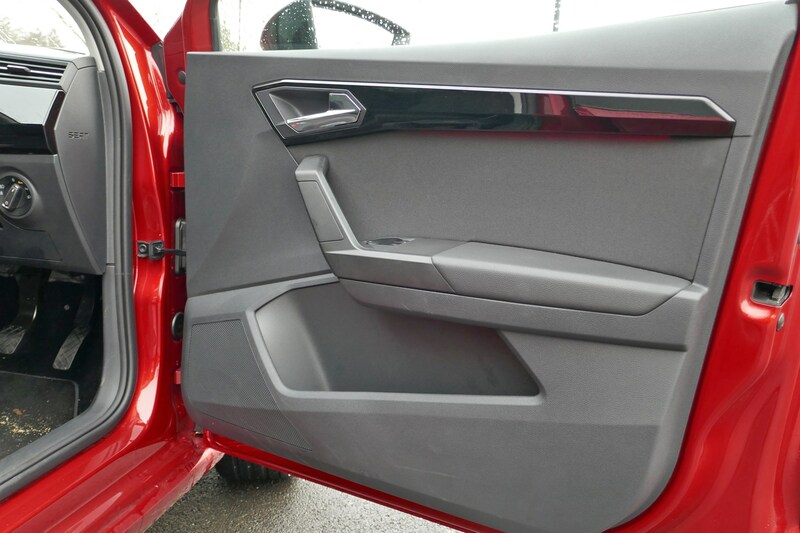 Similarly, the interior looks to be a significant step forward, but the visuals aren’t reinfornced with soft-touch plastics. It wouldn’t be a deal-breaker for me, but it would be a niggle for the time I owned the car. Overall it strikes a more pleasing ride and handling balance than the Fiesta for me. Sure, the Ford’s a fine car in both of those stakes, but the latest generation feels like an update of the car that came before it – the Ibiza feels like a newer, more desirable product to me. I’ve not yet driven a new Polo, but until I do, the Ibiza’s my supermini of choice. Fantastic finance with a year’s free insurance makes the Ibiza great value, but I simply can’t get comfortable in the driver’s seat of our FR. Sadly, this point alone would convince me to get a Ford Fiesta – despite much higher PCP monthly payments. If you can get comfy, though, the Ibiza makes far more sense. A really great responsive drive. The car was extremely agile with good feedback to the driver. Handled twisty country roads with ease and was a capable cruiser. I was pleasantly surprised by the 1.0-litre three-cylinder TSI engine which seemed to provide more than ample power and felt really punchy. A very impressive car in many ways, this little Ibiza. The handling is neat, the ride mature and it’s spacious for a supermini, too – while the engine’s a pocket firecracker. But the gearbox… oh, the gearbox. From the mushy shift-action to the super-long ratios, it comes close to ruining the whole car. But when you’re getting so much for your money overall, it’s probably going to be easy for most buyers to forgive this. SEAT will surely sell stacks and stacks of them. Not everyone prioritises having the most fun car to drive; some pride in a well-built interior instead and the Ibiza seems like a well-judged compromise in favour of that. The thing is, all the hopes of this being a really polished car disintegrates as soon as you drive off, with the three-cylinder engine vibrating right through into the cabin. The rest of the package is great, but I’ll stick to my Ford Fiesta, thanks. I’ve been lucky enough to take the Ibiza on a couple of long journeys, and have enjoyed every moment of them. The secret to the Ibiza’s brilliance, and why I prefer it to the much-lauded Fiesta, is in how grown up it feels. In terms of refinement, long-leggedness and overall fitness for purpose, it strides with the confidence of a Volkswagen Golf-class car, and yet remains as wieldy as the best supermini. 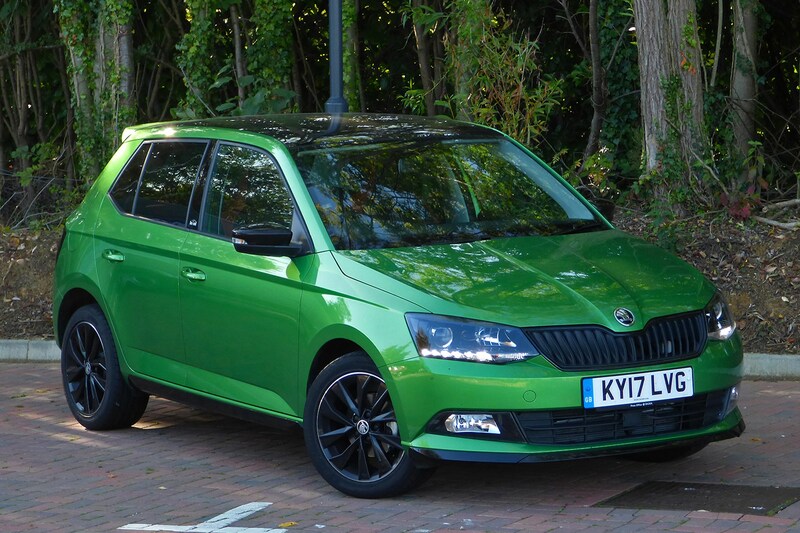 It’s a hell of an all-rounder, and bodes well for the Polo and next-generation Skoda Fabia. 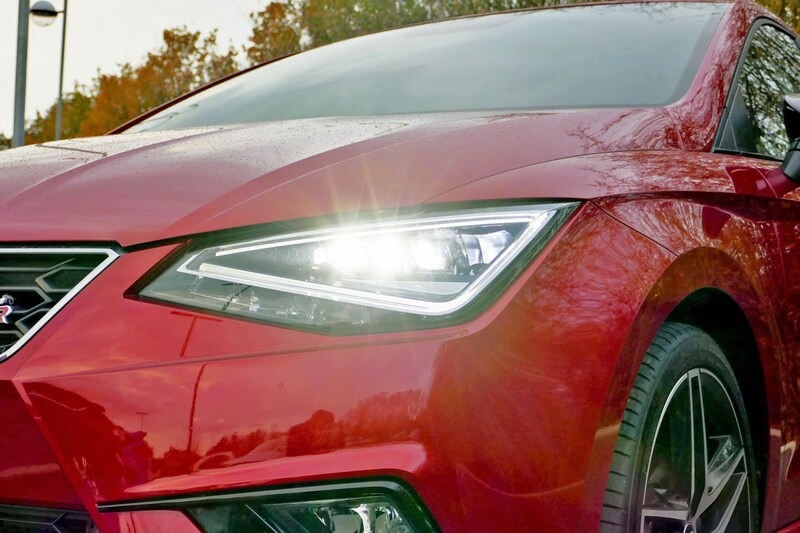 The Ibiza is arguably the best looking small car currently on sale, with some really nice, sharp design details like the LED lights at the front. The mature driving experience makes it a seriously desirable small car for those looking to downsize, plus its dinky 1.0-litre engine really punches above its weight. As a lifelong Fiesta-phile our SEAT Ibiza long termer had an uphill struggle ahead of it to convince me it was a better buy than Ford’s eponymous supermini. In terms of styling, both inside and out, I reckon it’s got it sewn up. 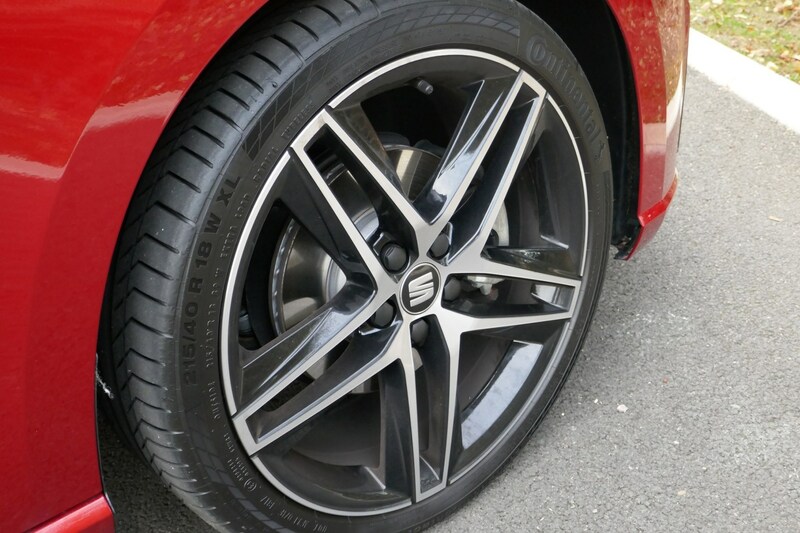 The massive 18-inch alloys help – I remember when putting 17s on a car of this size was a suitable undertaking, let alone a factory-fit option. Performance-wise, while the engine’s noisier than Ford’s three-pot it feels much stronger than its numbers suggest, making me wonder why you’d bother with the larger 1.5-litre FR. 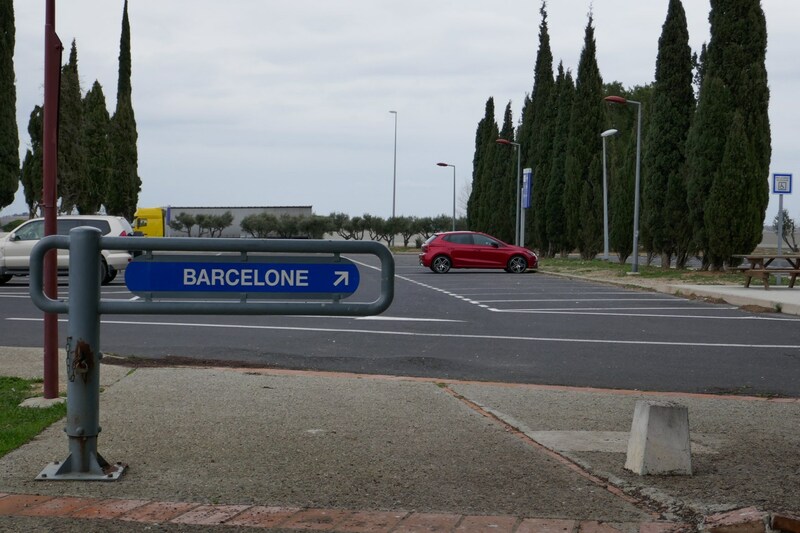 Ultimately the Fiesta is a better steer but in all other respects – especially SEAT’s superb PCP finance offering – it’s Barcelona 1, Dagenham 0. So, a car that – while not everyone totally gets along with – is universally applauded for being an excellent little supermini with sharp looks, a strong engine and grown-up feeling handling. Opinions over whether it beats the Ford Fiesta are split – so tune in for my thoughts in the next update. Ninth report: Which options should you buy? Nearly every manufacturer offers a plethora of options on its range of models, spanning from simple things like a luggage net for the boot, to wireless phone charging and a heated steering wheel. 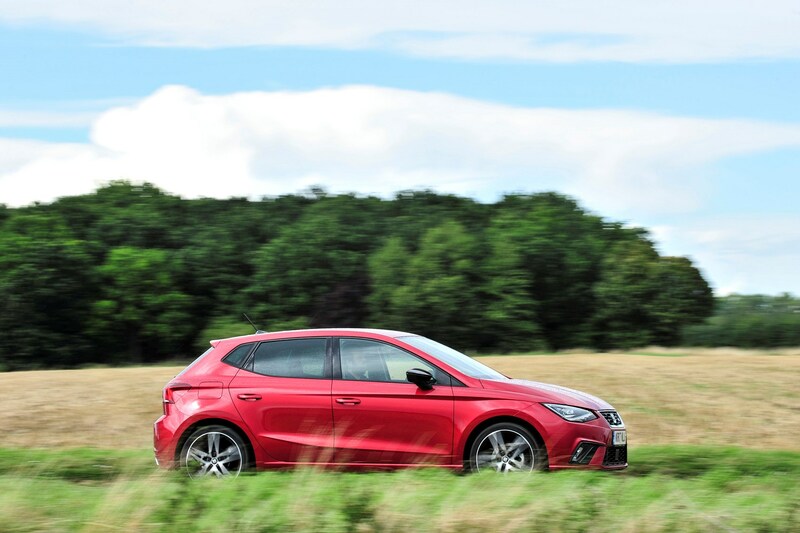 So, when it comes to my SEAT Ibiza long-termer, which options are necessary and which could I do without? A mixed bag, then, and obviously highly dependent on your budget. Only two of the seven options on this FR-spec car are essential in my book, so there’s the potential to save quite a bit of money if you’re picky. But, before you go out and order your brand new SEAT Ibiza with the Beats Sound System and KESSY, there are a couple of other things on the options list that I reckon are necessary. Call me old fashioned, but I like the security of having a trusty spare wheel (and so does the rest of the Parkers team). Puncture repair kits are always hit and miss, plus changing a tyre isn’t as hard as many people think (as long as you’re in a safe area). Add a space-saving spare wheel to your Ibiza for just £100. 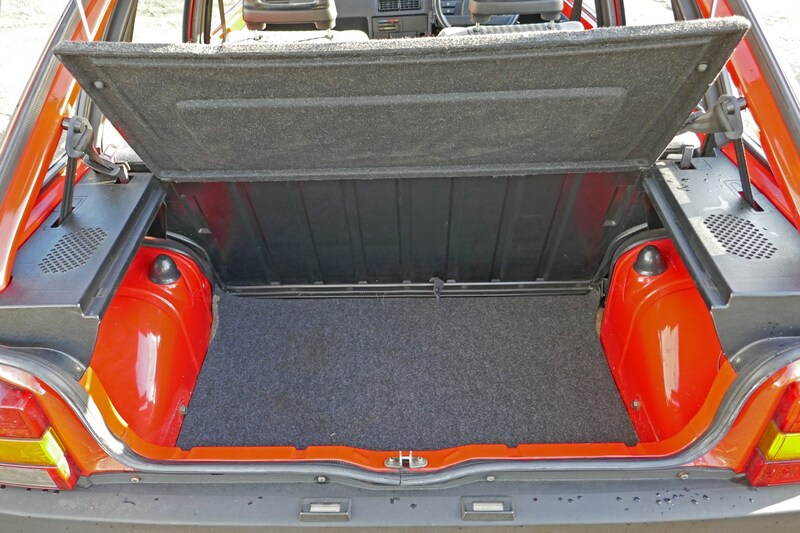 Something else that I reckon would be worth its weight in gold, is the £160 Storage Pack; including a double height boot floor, nets and hooks in the luggage area, plus a drawer under the front seats. Finally – and this is something that’s always bugged me about the Ibiza since it arrived last year – is the Vision Pack Plus. It’s only standard on Xcellence-spec cars, meaning I’ve been relearning the art of parking without sensors on the Ibiza over the last few months. I’m by no means saying the Ibiza is a particularly hard car to park but the sensors and camera make things so much easier, and do help when a space is super tight. Pricey, at £425, but worth it. I’m now into the final few weeks of SEAT Ibiza ‘ownership’, and as special treat for its service over the last few months, I decided to take it on a road trip back to from whence it came. 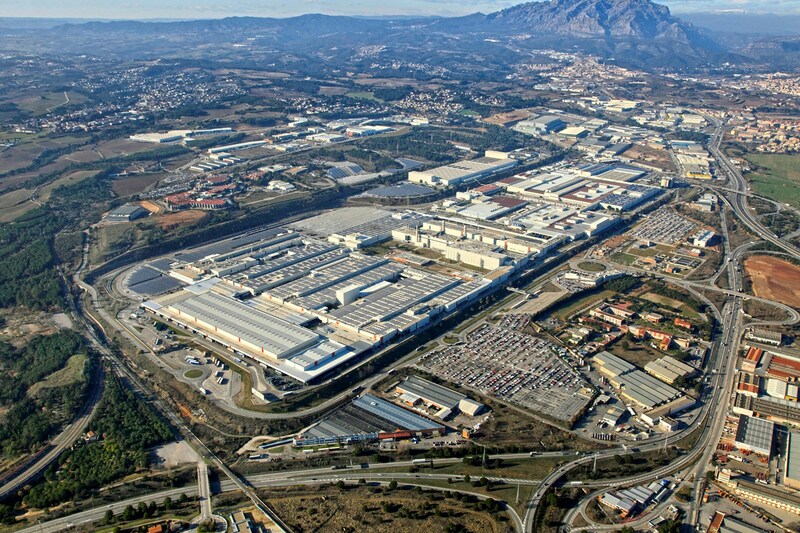 Namely, SEAT’s sprawling Martorell manufacturing plant just outside Barcelona. Now, while taking a brand new car across Europe to sunny Spain might not sound like the world’s most arduous task, it’s important to remember that, as little as 15 years ago, your average supermini would have been wholly unsuited to such an undertaking. Up at the crack of dawn, we (I dragged a non-driving passenger along with me) loaded up the Ibiza’s boot and headed for Folkestone. There was a time when proceeding straight to Dover was the port of call for voyages into France but I’m a fully-fledged Eurotunnel convert now. Letting the train take the strain scrubs almost an hour off of the crossing time, and allows you to get cracking in France far quicker than you would on the ferry. It is a little pricier, but if you’re willing to pay the difference, the Eurotunnel is by far the easier option. Rolling off the train in Calais, the Ibiza flashed up a helpful infographic outlining the change of speed limits in France. I’d already switched the digital speedometer over to kilometres an hour on the train, so no need to squint at the smaller digits on the analogue speedo or do any real-time calculations in your head. Around seven hours into the drive and approaching the end of the first day, the mood in the Ibiza was surprisingly buoyant. The Beats audio system was doing an excellent job of projecting the eclectic range of French radio music around the cabin, the LED headlights were penetrating the inky blackness of the near-deserted French autoroute and neither of the car’s occupants were suffering from any form of backache, earache or irrational hatred towards the vehicle we’d been sitting in for the best part of a day. It wasn’t all plain sailing, though; the car’s tiny 40-litre fuel tank – combined with an 80mph cruising speed – meant that fill ups were all too frequent. Our mid-40s mile-per-gallon average was looking more like late 30s on the faster French roads. Having completed the final few hundred miles to Barcelona on the second day, it was time to head to the SEAT factory. A seemingly simple task, but it did involve Monday morning rush hour in Barcelona. 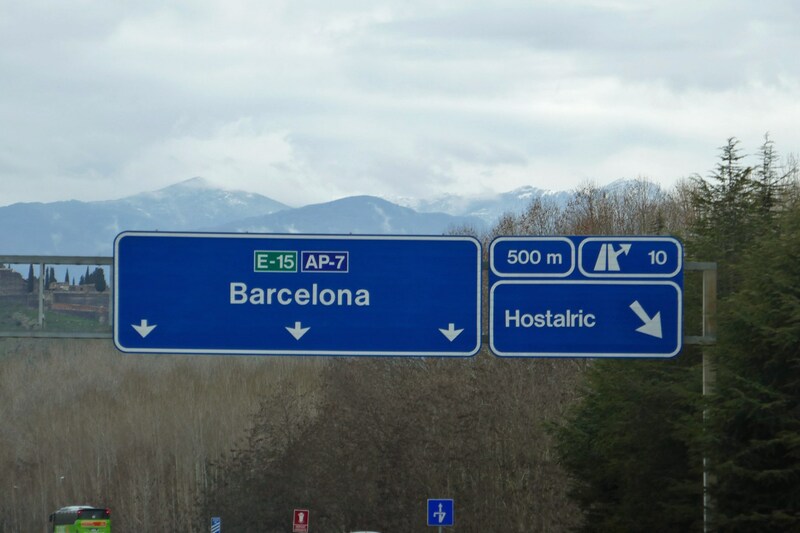 Those who drive in London during peak times will know of the often hair raising struggle, but trying to get somewhere in Spain’s second city is a different story altogether. There was less traffic during my brief stint through the city centre, but the level of gung-ho driving is something else. And my word are there a lot of scooters. Thankfully, the Ibiza’s small blindspots, punchy engine and compact dimensions meant I could fight my way through the melee and bring the Ibiza to its birthplace in one piece. Opened in 1993 by His Majesty Juan Carlos I of Spain, SEAT’s Martorell production facility is at the heart of the Spanish brand’s manufacturing operation. To give you an idea of its scale, the factory covers 2,800,000 square metres of land and is criss-crossed by a 15.5-mile road network. Over 1,282,000 cubic metres of water are consumed each year and a car is made every 40 seconds. SEAT may have made its name with small cars, but the factory is anything but. Sure enough, I got lost almost as soon as I got through the security gates – an impressive achievement, since the facility’s road network is painstakingly mapped out on the SEAT’s sat-nav. My UK-registered Ibiza probably got the most looks out of any car there, despite it being one of what – at a rough guess – was 500 2017 Ibizas parked up around the facility. Also on the agenda was a trip to SEAT’s heritage museum, a treasure trove for anyone interested in the company’s past. Housing hundreds of the companies finest past albums, including a one-off Popemobile, I took the opportunity to snap my long-termer next to the previous four generations of Ibiza – as seen below. The colour palette may have changed little, but the styling between the first and fifth-generation cars couldn’t be much further removed. 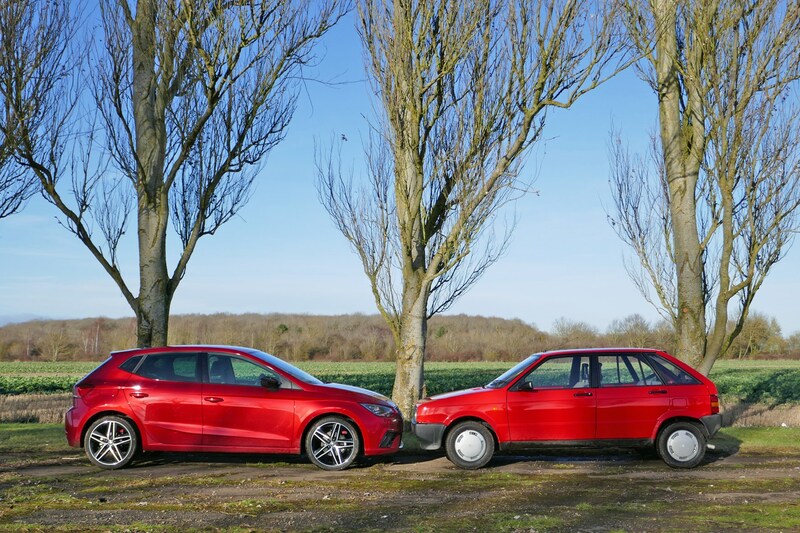 That said, the angular styling of the first generation car bared the most resemblance to our 2017 long-termer, the Mk3 and Mk4 Ibizas going with a curvier, more rounded look. Aside from another English car spontaneously deciding to swerve across four lanes of carriageway (and almost take the front off the Ibiza) just outside of Bordeaux, the 1,000-mile schlep back to the UK was as uneventful as the drive there. And once we did make it back to British soil, one thing was abundantly clear. The Ibiza is every bit the continent-bashing cruiser I hoped, but admittedly doubted, it would be. Were it not going back soon, I’d happily take it all the way down to the southern tip of Italy on my summer holidays, confident that I wouldn’t have to spend the first half of my break recovering from the journey. 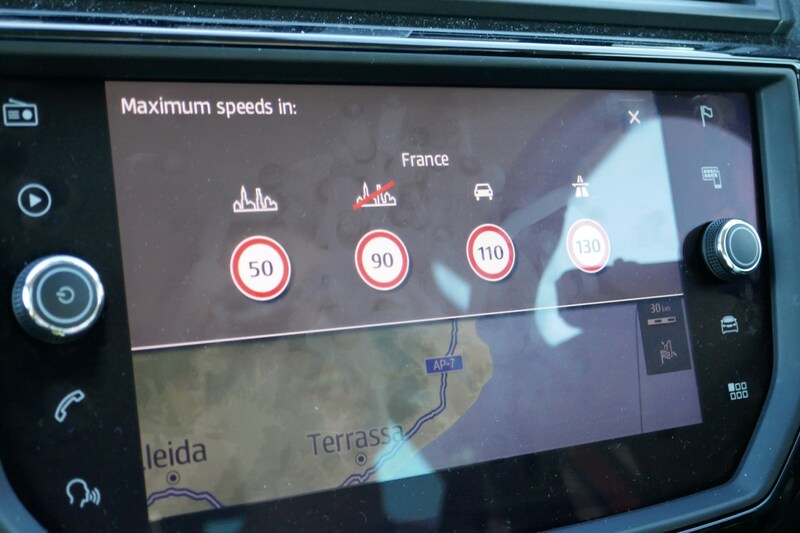 The optional cruise control came into its own on the long, empty French motorways and the car’s firm but comfortable ride was a match made in heaven with the smooth European roads. Yes, a little more power wouldn’t have gone amiss, but I never felt like the Ibiza’s tiny 1.0-litre engine was going to leave me flagging in the outside lane. So, what’s the conclusion to my mid-January escape to Spain? 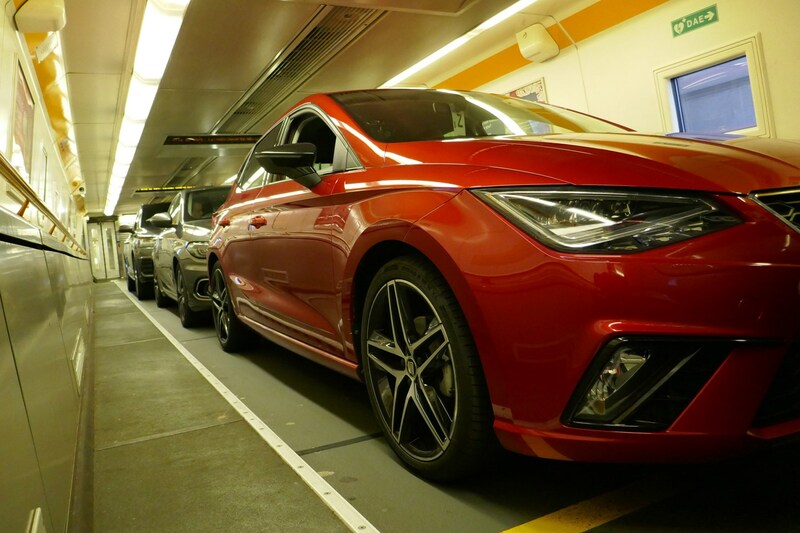 Well, if you’re thinking of buying a SEAT Ibiza for its compact proportions, excellent practicality and low running costs, but worry whether it’ll be out of its depth on the odd motorway run – don’t be. A couple of weeks ago I popped along to the UK launch of the 2018 Volkswagen Polo. 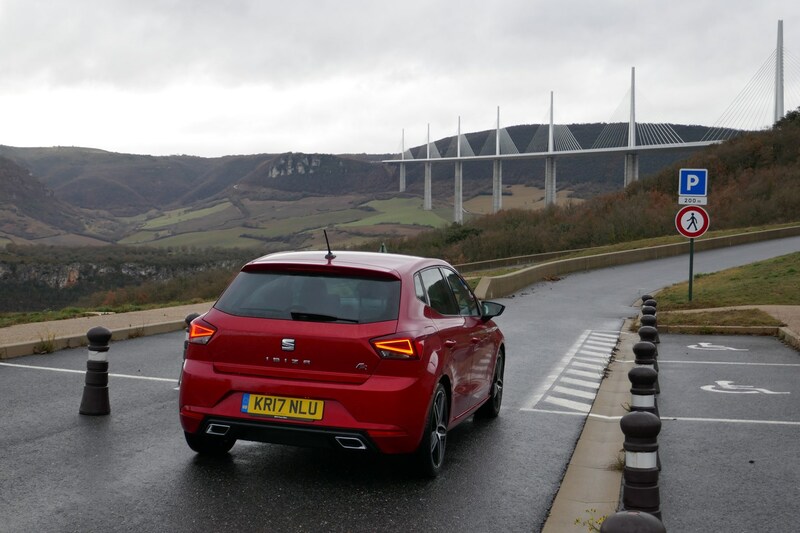 It’s a car that, as some of you will know, is built on the same MQB A0 platform as our SEAT Ibiza long-termer. See, the Volkswagen Group (made up of SEAT, Skoda and Audi among others) uses a similar blueprint for a number of its models, meaning cars like the Ibiza, Polo and upcoming Audi A1 all share the same underpinnings. Why is this relevant? In line with the manufacturer’s more premium image, the Volkswagen Polo is pricier than the SEAT Ibiza – coming in at £68-a-month more when we worked out the figures in our last update. With this in mind, is the mechanically similar Polo really worth a whole £816-a-year more than the Ibiza? Read on for the verdict. How does the Polo drive? To make things as fair as possible, I made a beeline for a Polo with the same 115hp 1.0-litre TSI engine as my SEAT Ibiza. Granted the model I came away with had a seven-speed DSG automatic gearbox (also available in the Ibiza) instead of the equivalent six-speed manual, but the comparison stands. 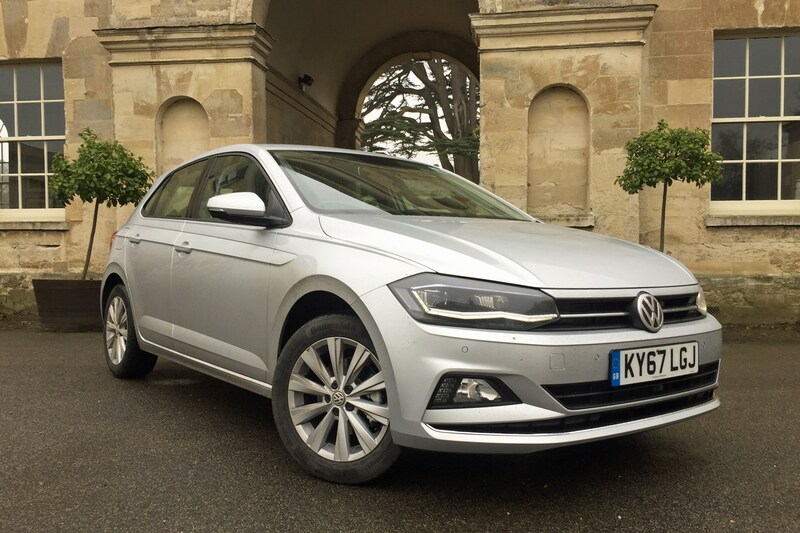 Out on the road, there was little to choose between the outright power and driveability of the two engines – the Polo perhaps being slightly more refined (likely due to extra sound insulation). The biggest difference was – and this is unfortunate for the scientific integrity of my comparison – the gearbox. 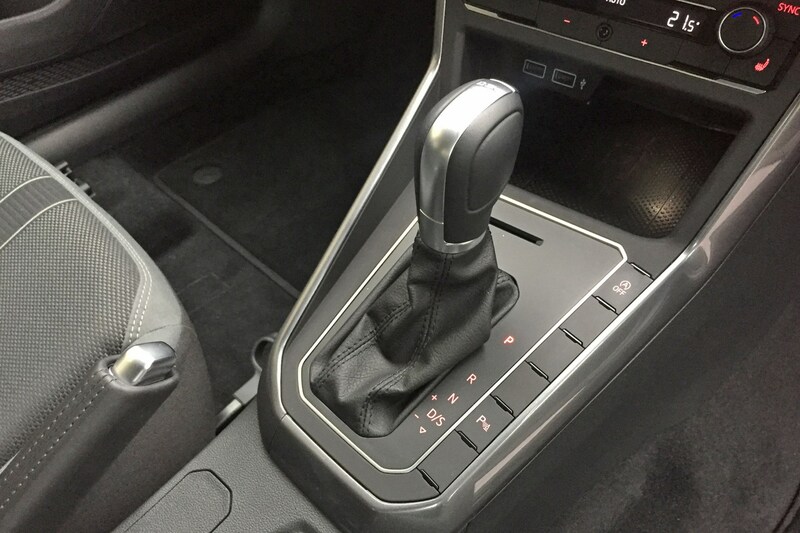 I’d always thought that automatic gearboxes in small cars were never a good match, but the seven-speed DSG in the Polo brought the best out of the engine. 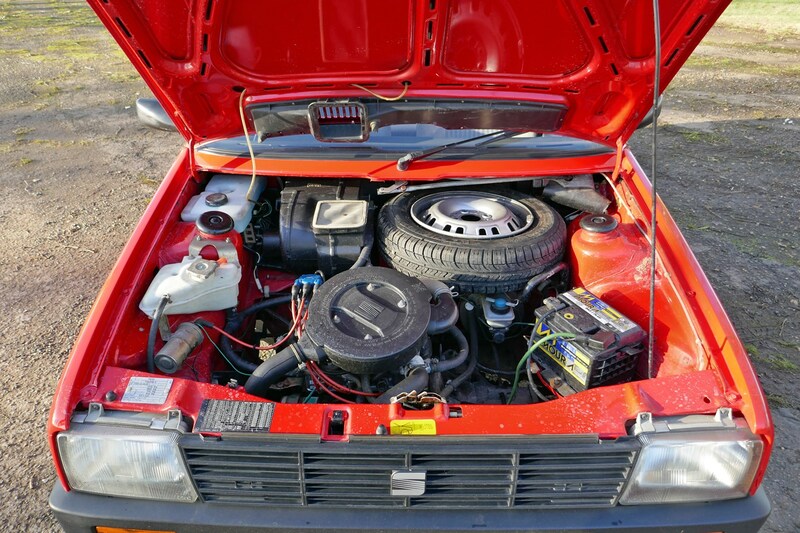 Although not short on pulling power, the auto ‘box was able to find exactly the right gear at exactly the right time to extract the most from the three-cylinder engine. Changes were smooth and timely, and rarely was the transmission caught out. 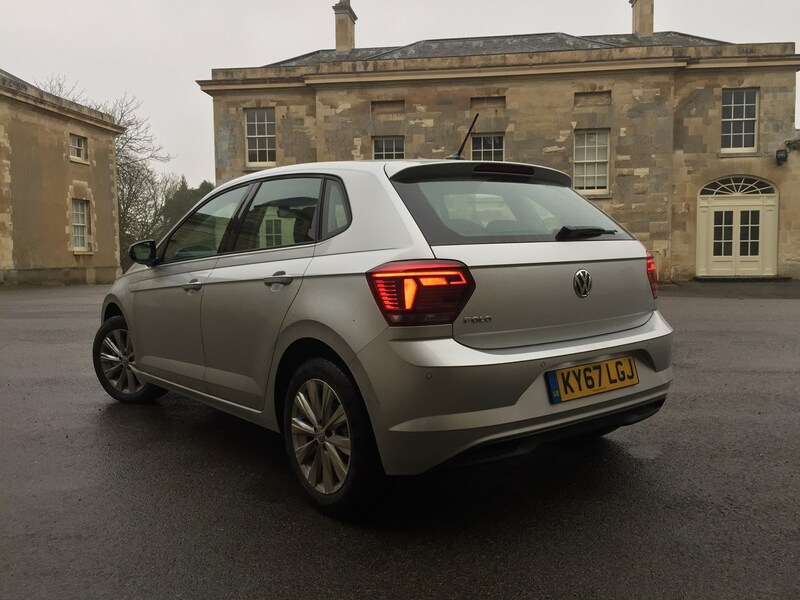 Overall refinement was slightly superior in the Polo, although not as much as the price gap might have you believe. 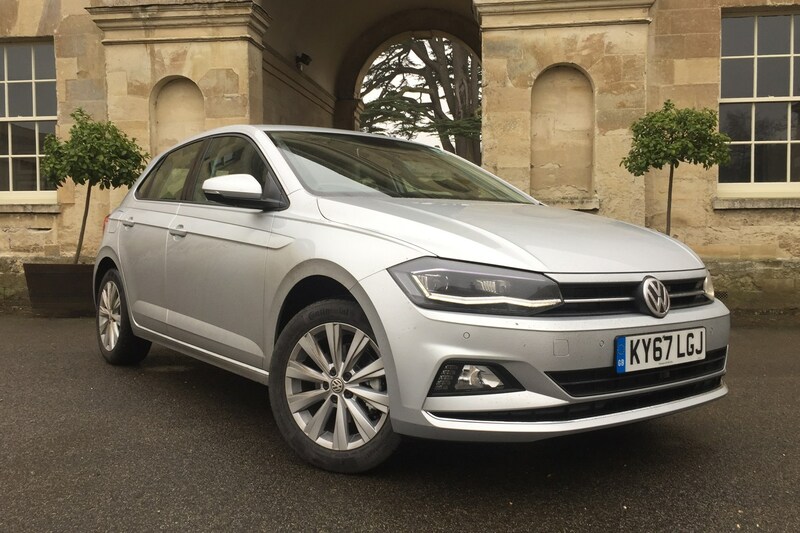 It’s hard to make a comparison on ride comfort (the Ibiza had 18-inch wheels compared with the Polo’s 16s, not to mention firmer FR suspension) but the Polo was predictably more pliant over rough roads. What’s the Polo’s interior like? Exceptionally well built, in a nutshell. The ‘it’s just like a mini Golf’ comparison has never been more apt, and while this model doesn’t have the optional Active Info Display (similar to Audi’s Virtual Cockpit) it’s still a step up in quality from the Ibiza – regardless of what spec you have it in. The materials, especially around the steering wheel, are class-leading and the overall finish is excellent. 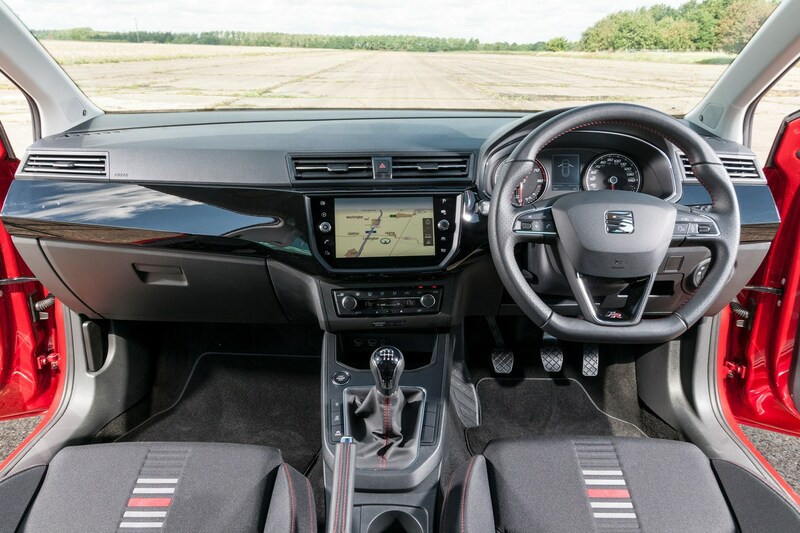 Mind you, the hard plastics haven’t been completely eradicated – with a decent amount hidden around the footwell and transmission tunnel – and the climate control switches are shared with the Ibiza. This might not have been the most precise comparison ever, but after my hour-long drive in the Polo I’m struggling to think how – if I was in the market for a supermini – I could justify spending the extra money on the Volkswagen. How much for an Ibiza FR on finance? Oh, and if you’re between the age of 18 and 80, there’s a year’s free insurance on offer, too. How much are the Ibiza’s rivals? I’ve selected the Volkswagen Polo R-Line, Ford Fiesta ST-Line and Skoda Fabia Monte Carlo as the main contenders here, and we’ve ranked them in order of how dear they are per month in descending order. Up next is the Ford Fiesta ST-Line, yours for £241 a month on almost identical terms to the Ibiza (yearly mileage is set at 9,000 instead of 10,000). Optional final payment is also more at £7,455. Parkers holds all of the above cars in high regard, with Ibiza and Fiesta both vying for top spot in one of the most congested and valuable sectors of the new car market. The fact that the Ibiza comes out on top for value is an incredibly encouraging sign for my long-termer, and evidence of just how hard SEAT is pushing its supermini. I’m curious, though. The Polo costs significantly more per month than the Ibiza, so what does it have that the SEAT doesn’t? Stay tuned for our next update to find out. With its light steering and pedals and a keen 1.0-litre engine, my Mk.5 SEAT Ibiza is a piece of cake to pilot, yet, predictably, its ancestor requires a little more effort. 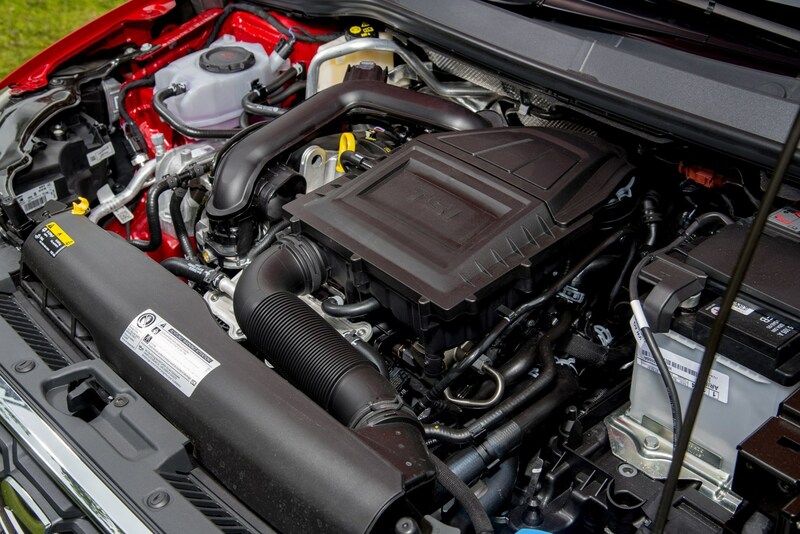 For starters, you need to fiddle with something called a choke (restricts the flow of air to provide a richer fuel-air mixture to the engine when starting up) to get it going. ‘Pull it about three quarters of the way out, turn the key and give it some gas’ – according to the man who delivered the car. He made it sound cheerily simple, which immediately made me sceptical. So just imagine my surprise when it sprung into life after barely a second of trying, its buzzy four-cylinder engine thrumming away under the squared-off-front end. With getting the car running a surprisingly stress-free experience, I turned my attention to making it move. Clutch in, I guided the gangly gear knob into what felt the most like first and looked for the biting point, which turned out to be somewhere around my ear lobes. No matter, as with a touch more throttle I was off and running, wrestling the unassisted steering wheel for the manoeuvre out of the parking space. One of the first things I noticed (apart from the peculiar indicator switch) was the way the Mk1 Ibiza dealt with the short, sharp speed humps in our office car park. Far from the coccyx-powdering experience I’d braced myself for, the little SEAT caressed the hard plastic ridge of ride-ruining misery and bounded towards the exit of the car park. Out on the open road and things were genuinely pleasant. The heater was working a treat and the levels of road and wind noise weren’t as deafening as expected. Granted the steering was a little vague and the 45hp 903cc engine was feeling every inch its 18.4-second 0-62mph time, but come on, what did I expect from a supermini nearly 30 years old? Even at 70mph (I eventually got there) in the outside lane of the M25 I didn’t feel intimated, uncomfortable or unsafe in the Mk1 Ibiza. It dealt with pelting rain, high winds and even a layer of snow with aplomb, and managed to carry me plus a couple of mates (one of which is 6’ 8”) with no issues. In a sentence - sparse, but adequately appointed. 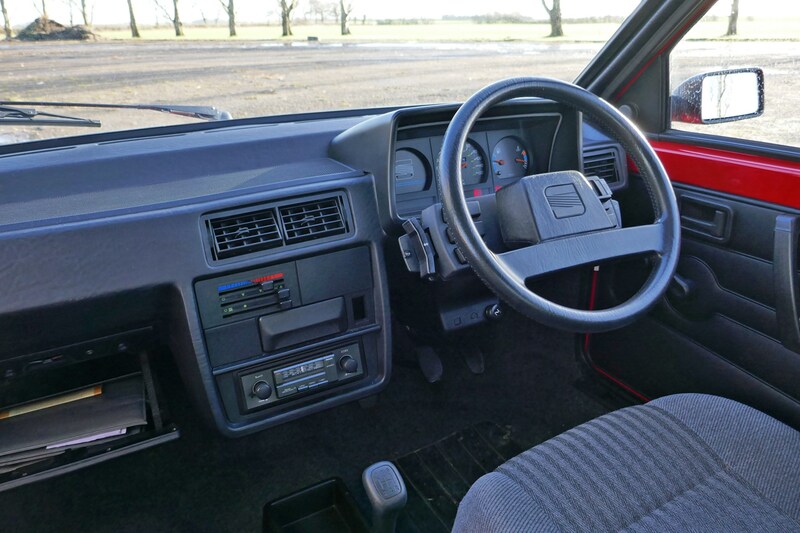 There was just about everything a small, cheap car of 1989 needed with a heater, a radio and a heated rear windscreen – with everything presented in its simplest form. Of most interest were the buttons around the steering wheel. SEAT’s designers clearly didn’t fancy having ugly-looking stalks protruding out from the steering column, so instead went with a selection of paddles and sliding switches to control functions such as the indicators, horn, lights and windscreen wipers. 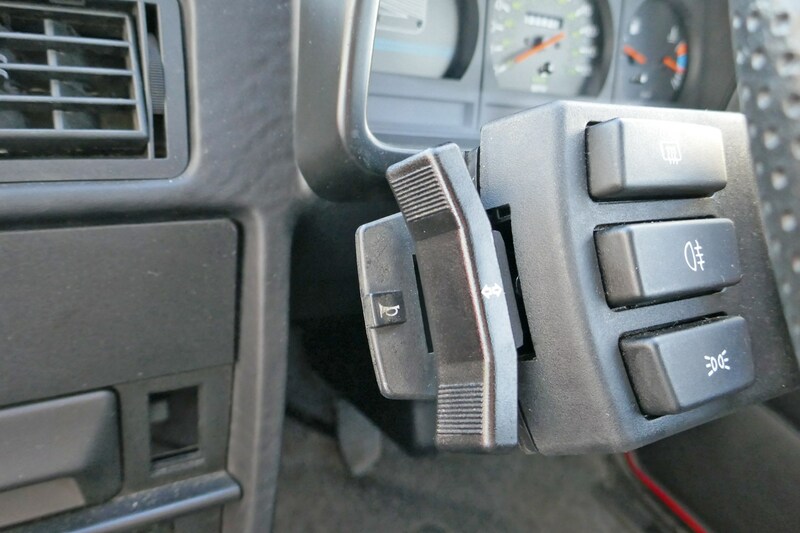 A particular favourite of mine was the windscreen washer switch that then needed the wipers to be manually activated in order to spread the fluid across the windscreen, a technique I’d mastered after a couple of days with the car. 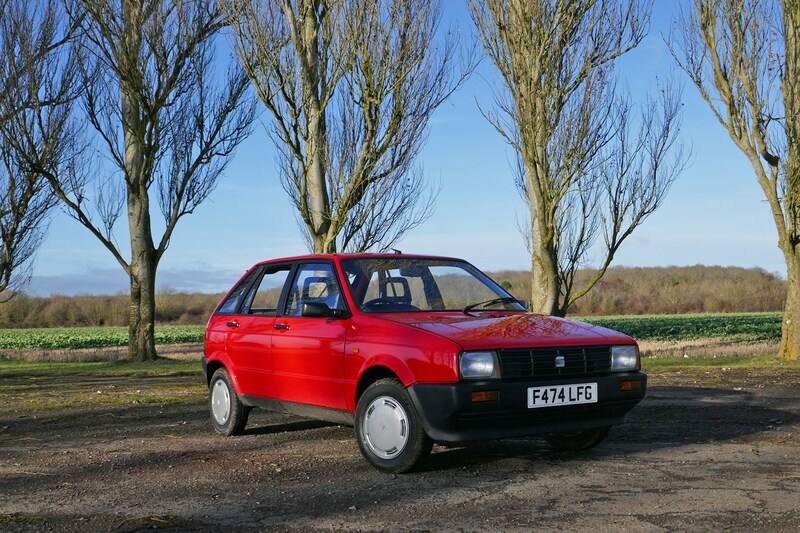 I was pleasantly surprised by the 1989 SEAT Ibiza. It proved old enough to be quirky and interesting yet young enough so that I didn’t feel out of place on modern roads. Every journey felt like an opportunity to get that little bit more out of the car by improving my driving technique and mechanical sympathy accordingly, while not overstretching the diminutive engine and basic controls. On that note, reliability was fine with me at the wheel, although an oafish colleague did manage to pick up a puncture while driving home (which, admittedly, could have happened in any car). Fourth report: To Apple CarPlay or not to Apple CarPlay? Nestling in the standard equipment list of my FR-spec Ibiza long-termer is Apple CarPlay and Android Auto mobile phone compatibility. 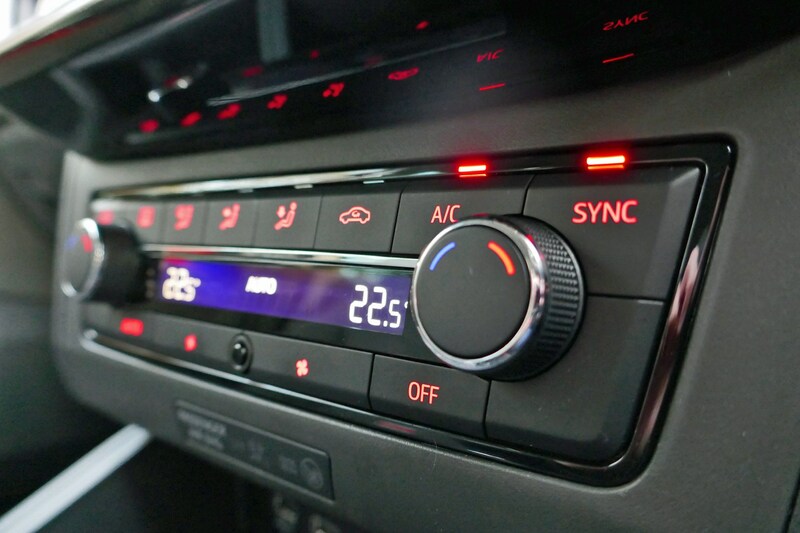 We’ve got explainer articles for the former and latter, but in essence the technology allows the user to mirror many of their phones apps and functionality onto the car's central infotainment screen. 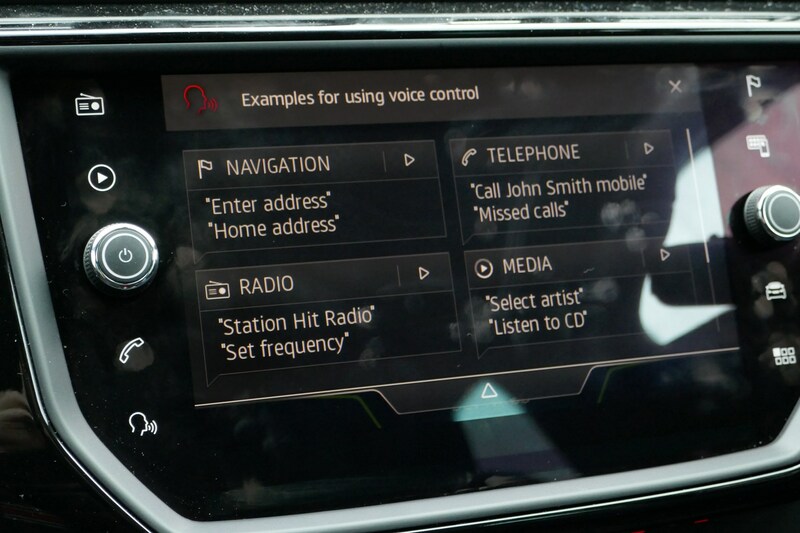 The standard SEAT infotainment setup is capable of doing all of the above without having to have your phone physically plugged in. 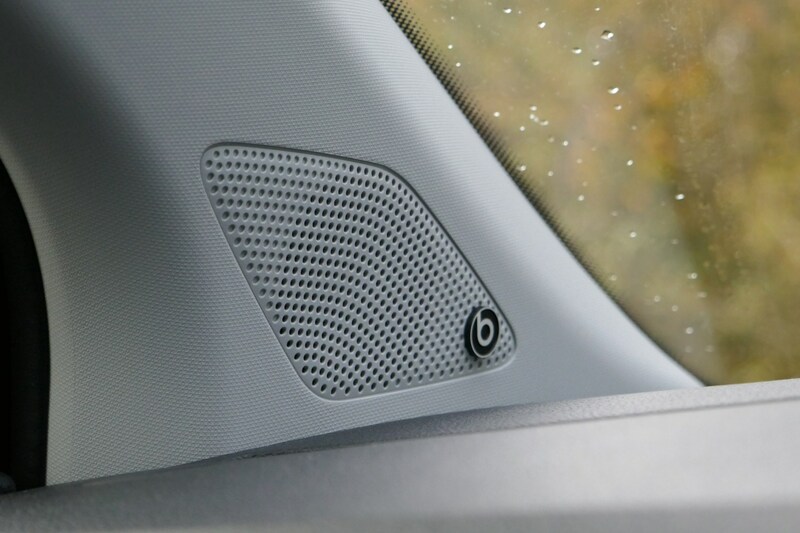 Using Bluetooth connectivity, music tracks and playlists can be cycled through using the Ibiza’s excellent menu system, incoming phone calls come through on the dashboard and the standard-fit sat-nav is also perfectly capable. Sure, Apple CarPlay features functionality from other apps such as Spotify music streaming and Audible audio books, although, for me personally, such benefits are not a deal breaker. That said, having messages read out by Siri, and being able to dictate a reply is mighty useful when used sensibly. 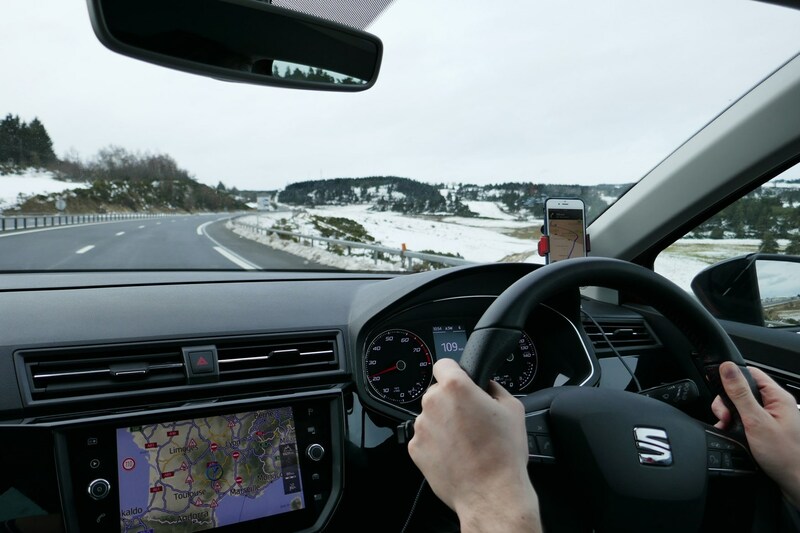 What is a clincher for me (and many other motorists), however, is the issue that arises if you try and mount your phone in the window and use it as a sat-nav. 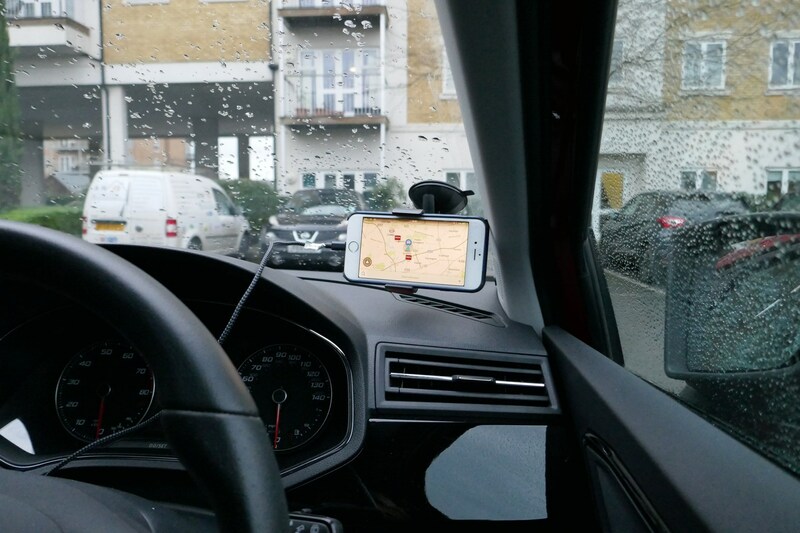 Third party mapping apps such as TomTom and Waze are, in my opinion, better than the built-in navigation systems found on production cars and as such, I use the latter on my commute to work. Yet, when using Apple CarPlay the phone’s screen always mirrors what you have displayed on the central touchscreen – i.e. if I switch to the music app on the car’s touchscreen this then also comes up on my phone, meaning I have to keep reaching over and flicking back to the sat-nav app. Not ideal. 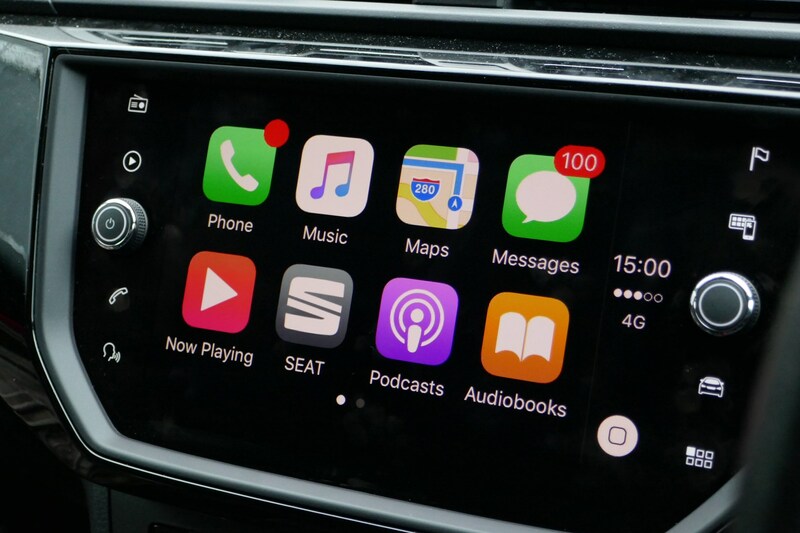 If you don’t mount your phone in the windscreen and like the idea of dictating text messages and having Spotify or Audible apps on the infotainment screen, then Apple CarPlay should work for you. However, for the moment, I’ll stick with SEAT’s own multimedia system, thanks. With winter in full swing and the Ibiza’s Desire Red paintwork caked in a suitable layer of grime, the first couple of gremlins have appeared on our long-termer. The driver’s door has picked up a nasty vibration when anything remotely bassy comes over the speakers, and there’s an odd whirring sound coming from somewhere behind the centre console. 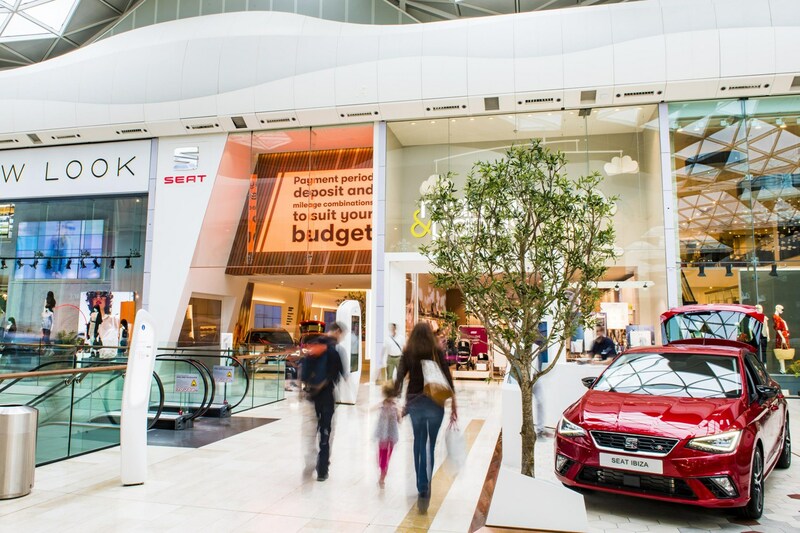 Keen to turn something negative into a positive, I gave the SEAT Store in Westfield London a call to see if I could book the car in for a quick check-up. Why the SEAT Store? Well, for starters, it’s only a short schlep from where I live, and, secondly, I wanted to try out its drop-off and collection service. See, while my car was going to be looked at elsewhere by a technician, the SEAT Store allows you to drop the car off at the Westfield Shopping Centre should it be more convenient than driving to the dealer. So, all I had to do was park up, sign a couple of forms, show a technician exactly what the issue was and then drive off in my SEAT Leon courtesy car. Easy. 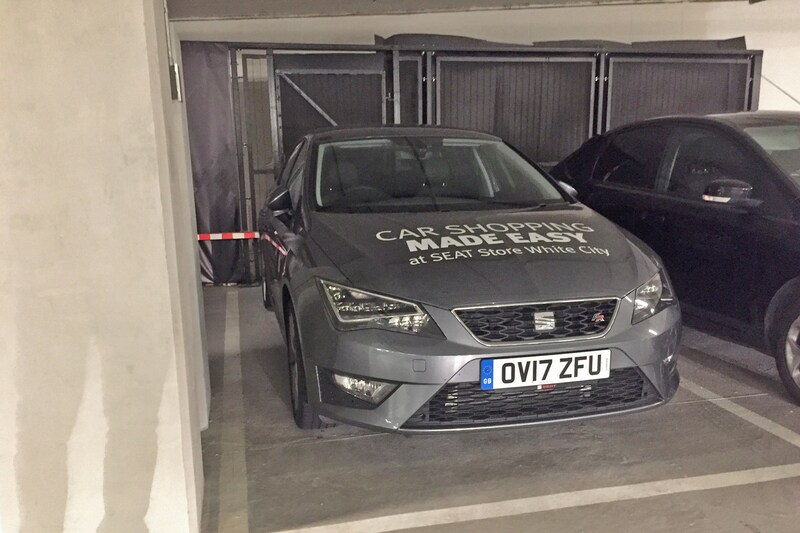 Tearing my hair out in the multi-storey car park aside, my 150hp SEAT Leon courtesy car was an excellent stand-in for the Ibiza while the latter was getting a little TLC. A few days after dropping the latter off, I received a phonecall from a SEAT Service Advisor at the main dealer explaining that all necessary repairs and checks were complete and that my car was ready to collect. Did they fix the problems? Yes and no. The vibrating door was cured but the whirring noise remains – although apparently it’s a perfectly normal sound for the car to make. 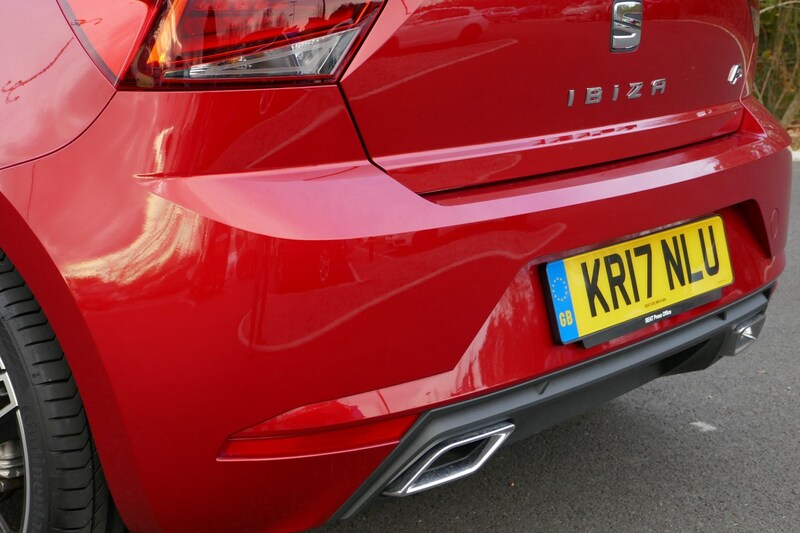 One to keep an eye on when we get other variants of SEAT Ibiza in on test. On the whole then, a satisfying experience. The communication was excellent, the courtesy car great and the level of work carried out on my Ibiza appears to have been of a high standard – it even got a complimentary clean for when I picked it up. Would I have received the same experience if I wasn’t driving a SEAT press car? It’s hard to say for sure, but I saw no evidence to suggest that the employees of the Store or dealer were giving me preferential treatment. Another thing I noticed this week was a fellow new SEAT Ibiza FR with the same Desire Red paintjob as mine. And yet, for me, it looked nowhere near as sharp as my long-termer on its optional 18-inch Performance bi-colour machined alloy wheels. 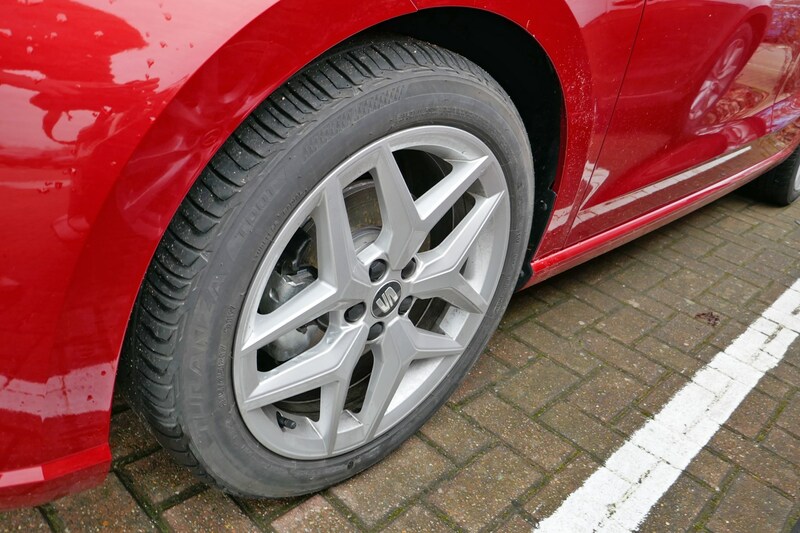 The standard 17-inch Dynamic alloys just make the car look a little bland – so money well spent in my opinion. Well, apparently not. The 1.0-litre three cylinder engine makes excellent use of its available power, and feels far punchier then a 1.0-litre engine has any right to be. I mean, it’s not up there with my dearly departed SEAT Leon ST Cupra (thinking about it brings a tear to my eye) but there’s more real-world oomph than I was expecting from such modest figures. I know, it really didn’t take long but for the comparisons to begin but that’s what happens when you go after the Fiesta’s No.1 spot in the sales chart. I won’t draw too many conclusions at this early stage, but a recent drive in Ford’s all-new Fiesta left me with a couple of observations. Number one – I much prefer the look of my Ibiza to the new Fiesta. It’s so much more angular and purposeful in my eyes, and looks like SEAT has gone out and made a really statement with the design. 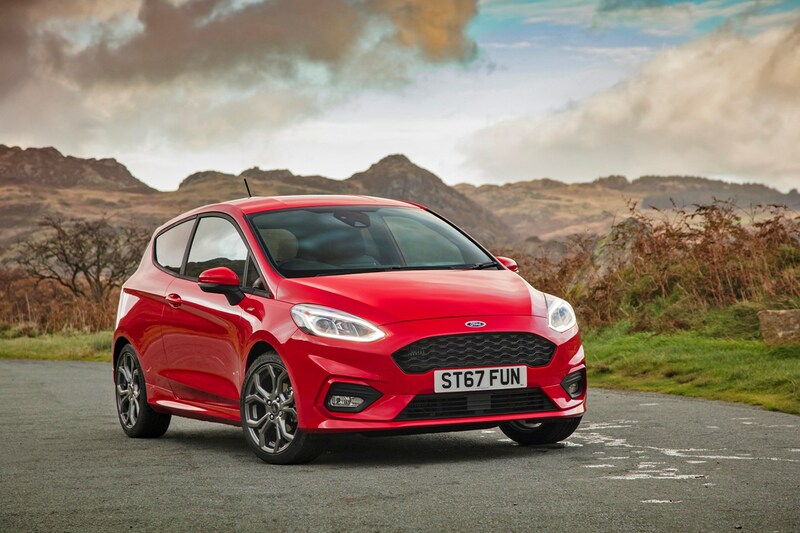 Ford on the other hand has – somewhat understandably – played it safe with the Fiesta and as a result it doesn’t quite have the visual clout of my Desire Red Ibiza. My other impressions however were in favour of the Blue Oval. Cruising down the motorway the Fiesta is noticeably more refined and comfortable than the Ibiza, while the crisp, colourful TFT screen between the dials is so much nicer to look at than the SEAT’s black and white display. Obviously the former point is of greater note and some of it may be to do with the Fiesta featuring smaller wheels and a regular, non-sporting trim and suspension set-up. Either way, I’ll be sure to put the two main supermini contenders next to each other for a comparison in the coming months. 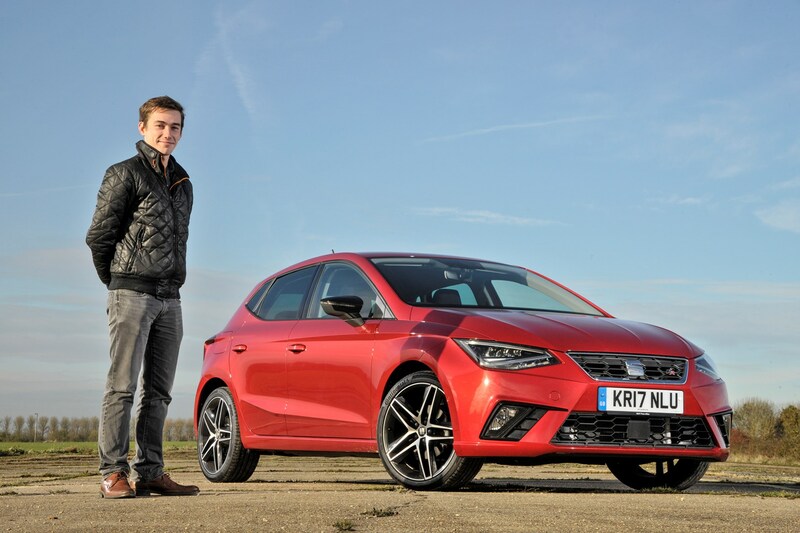 Fresh from its victory in the Best First Car category of the 2018 Parkers New Car Awards, the SEAT Ibiza supermini has joined the motley gaggle of long-term test cars. In essence, this means one of the most eagerly-anticipated cars of 2017 is mine to (within reason) do what I want with over the next six months. I have some rather big plans for this little car, but more on that in the coming months. First, let’s take a closer look at KR17 NLU. Of course, I’m (hopefully) joking, but it’s going to be interesting to see how a car we rated so highly back in the summer fairs when we have to live with it for half a year. 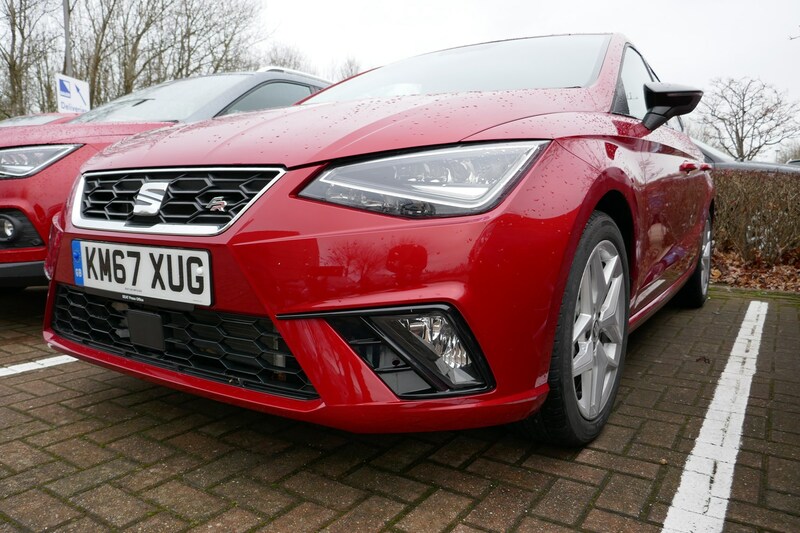 Secondly, SEAT has pulled out all the stops with the new Ibiza in the hope that it can claw back some ground on the runaway sales success that was the previous generation Ford Fiesta. On first impressions, we reckon it’s closer than ever between these two cars, a few thousand miles at the wheel of the challenger will be an excellent way to find out if we were right. The fifth-generation SEAT Ibiza comes in a large number of trim and engine combinations, ranging from the base 75hp 1.0-litre S to the top-of-the-range 150hp 1.5-litre FR. There’s also a premium Xcellence spec although, puzzlingly, it’s only available on the smaller engines. I’ve gone for what I reckon is the sweet spot in the range – namely the sporty FR-trim paired with a 115hp 1.0-litre three-cylinder engine. Boasting a healthy 200Nm of torque and a six-speed manual gearbox, it’s good for 0-62mph in 9.3 seconds, with a top speed of 120mph. I won’t get to use the latter figure (in this country, at least) but the former should get a workout on the myriad of motorway slip roads I use in the morning. First impressions are good, too – the engine feels punchy and delivers over 50mpg. Not quite its 60.1mpg claimed figure, but we’ll work on getting our actual figure up during our time with the car. 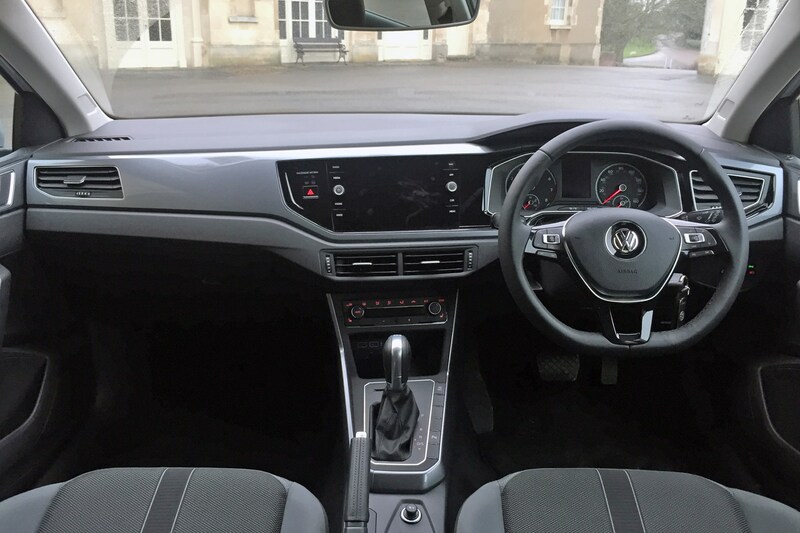 As for the trim, there’s a good selection of standard kit including an 8.0-inch colour touchscreen with sat-nav, Apple CarPlay/Android Auto, cruise control, sports suspension, switchable drive modes and FR styling tweaks. One – rather disappointing – omission from the kit list is any form of parking aid. I know it’s only small car, but for a near top-spec version surely there should at least be rear parking sensors? Should you decide you really can’t do without them, they are available for a reasonably-modest £220 at the time of writing. As ever, I’ve poured through the Ibiza’s brochure and picked out some choice optional extras to (hopefully) make my time with the car that little bit easier. All prices are correct at the time of writing.